Salut! opened in 2002 for just 2 months…and during those two months we sold more of the Shotfire Shiraz than any other retailer in Washington did for the ENTIRE YEAR! It was because we discovered this great wine by tasting it, and then sold it like wildfire before the ratings were issued. Eventually, the wine scored 94 points out of 100, and sold out in an instant. Each succeeding vintage has scored over 90 points as well. Since 2002, we’ve had difficulty getting this wine in any respectable quantities, but here it is for our wine club members! The 2007 is again full of rich berry fruit and full body. It’s a perfect match with slightly spicy and ultra saucy BBQ red meat fare, but I just sit around and drink it for the sheer joy of it. Bits of Cabernet Sauvignon, Petite Verdot, Merlot and Cabernet Franc add to the wine’s character, which right now is a bit young…I think 6 months of bottle age will lift this wine into the stratosphere of enjoyment. 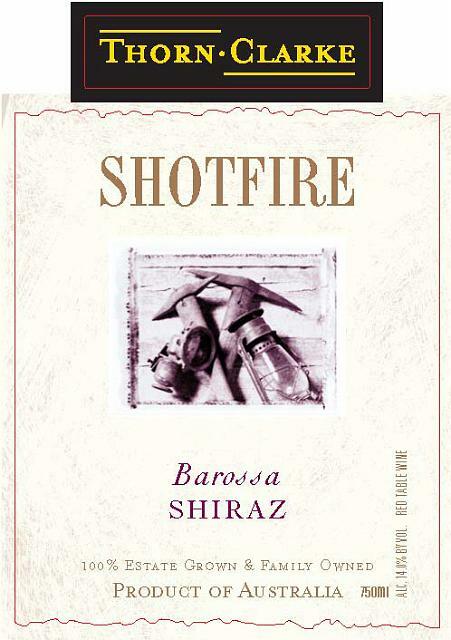 David Clarke, the winemaker, describes it as “another outstanding Barossa Shiraz. The bouquet has lifted fruit aromas, while the palate displays typical Barossa varietal Shiraz characters of chocolate and plum fruit. Expert use of oak has resulted in subtle vanillin flavors.” I can’t wait to taste some of my held bottles in about a year. This wine is now SOLD OUT. Be sure to try our other club wines before they are gone!